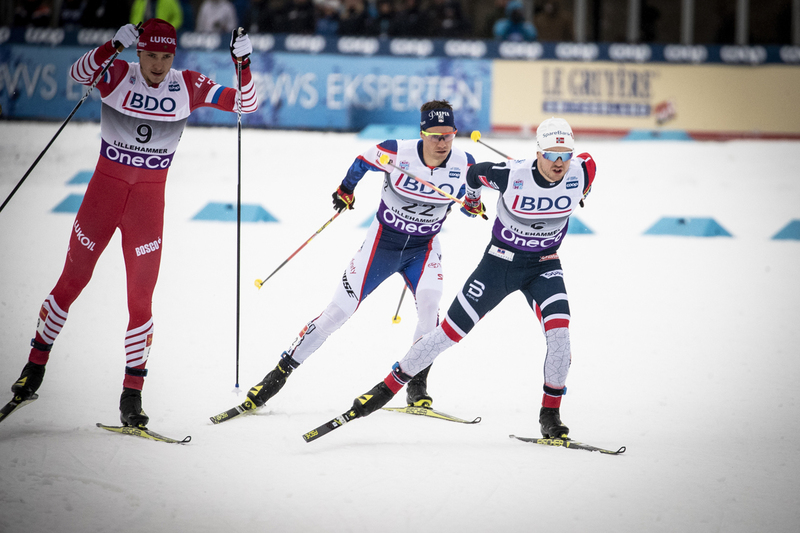 At two minutes into the men’s 1.6-kilometer freestyle sprint in Lillehammer, Norway on Friday, the six skiers in the final were strung in line — each milking a draft into the banked left turn before the final climb. Norway’s Emil Iversen was in the lead — the workhorse pushing the pace for much of the race. Behind him were Italy’s Federico Pellegrino and Canada’s Alex Harvey zooming around the corner and stepping into the climb. Halfway up the climb, a flip switched for Pellegrino – he was a flurry of V1 turnover as he built a five-meter, then a 10-meter gap — and a world of momentum — descending into the final straight. Sporting Italy’s green lycra, Pellegrino never stopped accelerating towards the line to win in a time of 3:19.17 minutes. Iversen was second (+0.44), while Harvey hustled down the line to take third (+0.68). 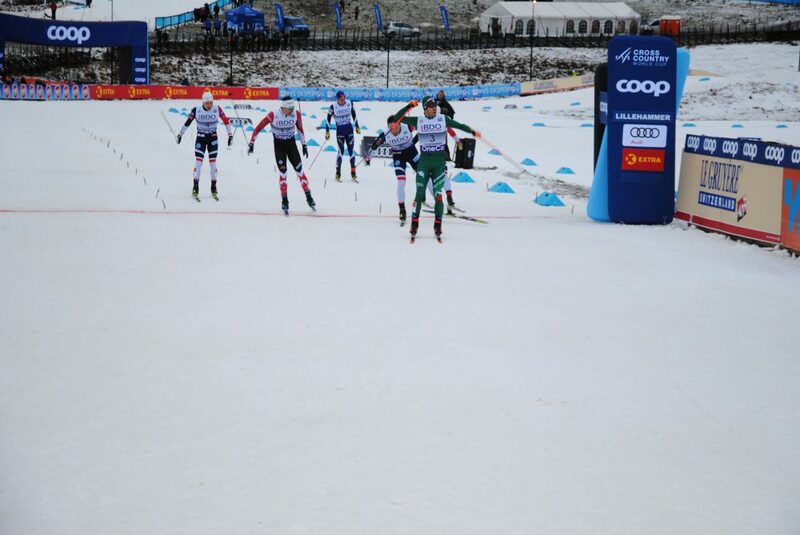 Pellegrino crosses the finish line in the final of the men’s 1.6 k skate sprint in Lillehammer, Norway. Pellegrino remains the record holder for World Cup skate sprint wins — today was his 11th victory in the discipline. For second place Iversen, it was his second podium in as many World Cup venue stops. Last weekend he placed second in the 15 k individual start classic in Kuusamo, Finland. Iversen was fourth in last Saturday’s classic sprint. In this nascent World Cup season, Iversen sits second overall after three races on the World Cup with 176 points. Russia’s Alexander Bolshunov, who won both races in Kuusamo, finished in 21st and sits atop the overall with 210 points. Lurking, but no stranger the to the upper tier of the World Cup is Harvey, sixth overall in the standings. Harvey won the fifth heat to advance to the semi-finals on Friday. He was then the second lucky loser to advance to the finals. Harvey explained after the racing ended that speed-tactics had helped his hand. 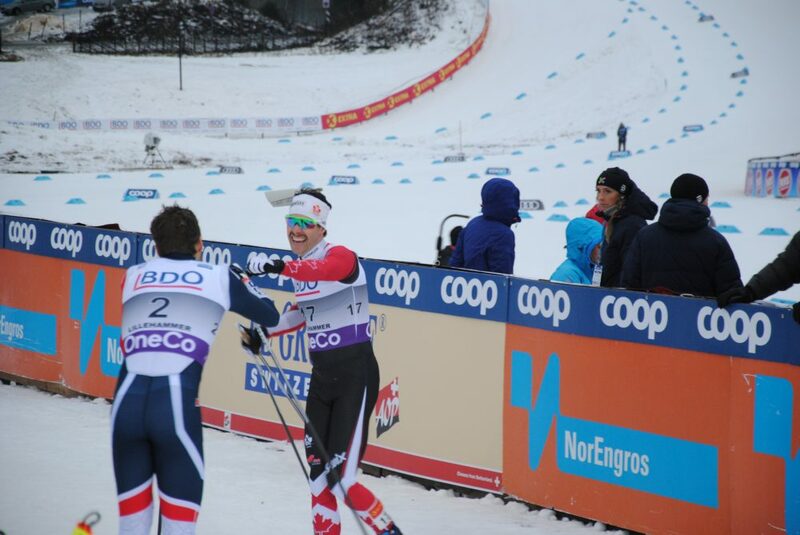 Canada’s Alex Harvey congratulating Norway’s Emil Iversen. Harvey placed third in the men’s 1.6 k skate sprint in Lillehammer, Norway. Iversen was second. 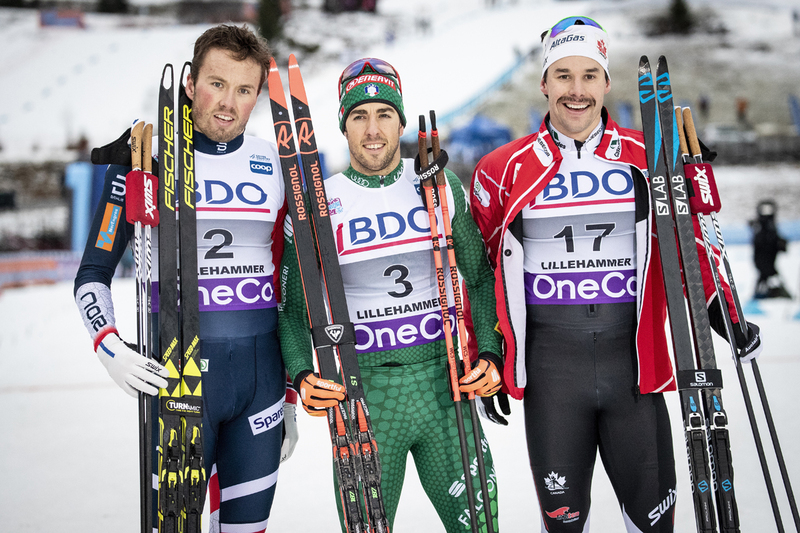 It was Harvey’s 27th World Cup podium and his first of the 2018/2019 season. Harvey often claims to begin his World Cup campaign with an element of caution when it comes to peaking. It’s true, his results tend to improve as the season progresses and the key races arrive. Last year, Harvey didn’t podium until January 6 during the 15 k classic in the Tour de Ski (TdS). In 2017, his first podium came on January 15th, in a team sprint. He went on that year to win the 50 k skate at the Lahti Worlds. His primary objectives for this season remain further out — the Tour de Ski (TdS), the 50 k and skiathlon at Worlds, and the season finale in his home province of Quebec. The U.S. Ski Team’s (USST) Simi Hamilton, coming off a fall early in his Ruka qualifier last Saturday, rebounded to qualify 22nd (+8.72) in Lillehammer. Hamilton was eliminated in today’s fourth heat and placed 19th overall. Hamilton also told FasterSkier’s reporter in Norway he’s feeling sharp. Like many others, he’s focusing on the Seefeld, Austria Worlds as the main objective. Hamilton trends towards better results in skate sprints, which the World Cup schedule is heavy with this year. As a three-race series, with an overall winner named after the classic pursuit on Sunday, many distance skiers were entered in the sprint. Beyond Harvey and Hamilton, no other North American men qualified for the heats. The USST’s Kevin Bolger was the next best placed American in 61st (+14.63). Also for the USST, Erik Bjornsen was 63rd (+15.04), Paddy Caldwell 82nd (+19.34). David Norris (APU) placed 90th (+20.71), Scott Patterson of the USST finished in 92nd (+22.21), and Adam Martin (CGRP) 108th (+32.72). For Canada, Andy Shields placed 60th (+14.59), Russell Kennedy (Team R.A.D.) 64th (+15.21), Julien Locke (CNST) did not start due to illness. Racing continues Saturday for the men with a 15 k skate.